1.8.7.2 What Else Do I Need To Complete My Bathroom? 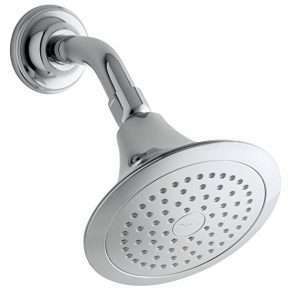 ShowerMeister specializes in all bathroom equipment including shower heads, shower cabins, bathtubs and much more. If you landed on this page, you are probably looking for the best shower head that there is, and we are going to take a look at each of them separately and help you choose the best shower head so you can be satisfied. In this page, we are going to see the best of all shower head types. If you want a specific type of shower head please chose the correct one you need from the menu above. Let’s start with a quick comparison of them, shall we? Let’s start this list with a rain head. This is a really good and quality product which can be fitted in any kind of bathroom with ease. This product has a lot of features which we were amazed of. It has a built-in speaker which can be connected to any device via Bluetooth. The sound it produces is very high quality, loud and clear. This is a perfect option for people that like to sing in the shower. The speaker also has a function inside it with which you can answer phone calls while in the shower, and it has a battery life of up to 9 hours of non-stop use which can be recharged using a USB cable. This shower head really does give you a luxury experience when you are in the shower, and you get all that for a very affordable price tag. Compared to other shower heads int his price range this really gets the cake. Okay now let’s get to the most important part, the shower. Since this product is not a handheld one, you won’t need to use only one hand to wash yourself, and using this shower head you will be able to finish your showers faster, of course, if you can leave the amazing feeling of taking a shower with this product. I would say this is a really good option for people that want to purchase a new head. It has everything you would want and need while taking a shower, and it all comes with an affordable price. At number 6 we have a Speakman , Speakman is a very famous and reputable company when it comes to making bathroom products. Most (almost all) of their products receive very good feedback from costumers, and this one is not an exception. 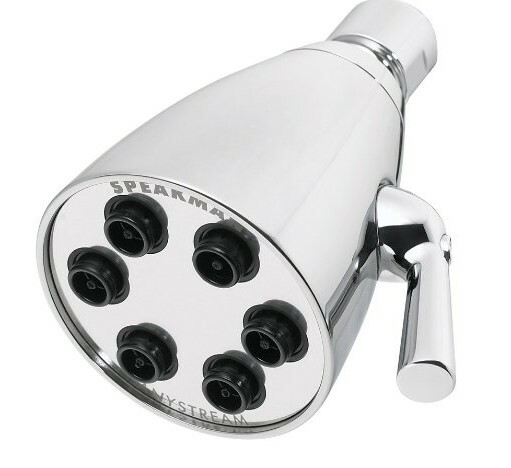 This shower head has the Anystream 360° technology, which is patented by Speakman. This patented technology is what makes this head unique. The Anystream technology is the possibility of being able to rotate the handle to seamlessly transition between water spraying patterns. The Speakman S-2252 is made of really high-quality solid brass material, which means that this shower head is very durable, and will probably have a very long life. Since it’s made of high-quality brass, it won’t get rusty anytime soon, even though it’s exposed to water non-stop. I mentioned above that this is one of the best available on the market, and it has a lot of features to back it up. This shower head has 48 different very powerful sprays which can be customized in any way you like to give you a good experience while you are taking a shower. It also has 3 different settings you can choose, one is the Intense spray setting, then the Rain spray setting and finally the Flood setting. All of these settings give you a different experience and feeling when you are taking a shower. Overall I would say this shower head is a good choice and can fit any bathroom. It’s also very beautiful and small. It comes in 4 different colors, so you can pick the correct one to match your bathroom design. By the way, do not get confused by the name. It’s called Speakman but it doesn’t have any speakers in it. If you are like me and like to have showers in the dark, then you will love this shower head. The DreamSpa Aquafan is a great option for people that like to shower in the dark because it has LED lights built in which look absolutely beautiful. They also change colors automatically or you can set the one that you like and enjoy your shower. They also can change based on the temperature of the water, for example, if the water is getting too hot then the LED will be red, if it’s too cold it will be blue and so on. Another thing that is unique about this product is that it has a temperature display on it included, which will show you the waters temperature in real time. You don’t have to wait and check every 5 seconds if your water is ready, now all you have to do is just throw a look at the mini temperature screen and you’re good to go. The thing that I liked most about this shower head is that you do not need any batteries to charge the lights or the temperature monitor because all of it is powered by running water. This shower head is not handheld also, which means you can relax while taking a shower with this product without having to worry too much. It’s extremely easy to install and you don’t need to call a plumber or a professional to do it for you because it can basically be done by anyone. You can just follow the instructions or take a look at a tutorial on the internet if you have never installed one before. Overall this is a good choice and it is not very expensive, so I would say it’s definitely worth it! This shower head does indeed have a long name, but it’s a great shower head that is very affordable and very simple to use and install. 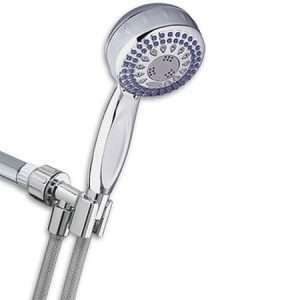 The Kohler K-10282 is also a popular choice by many people that are looking for shower heads, and most of them were satisfied with its performance. 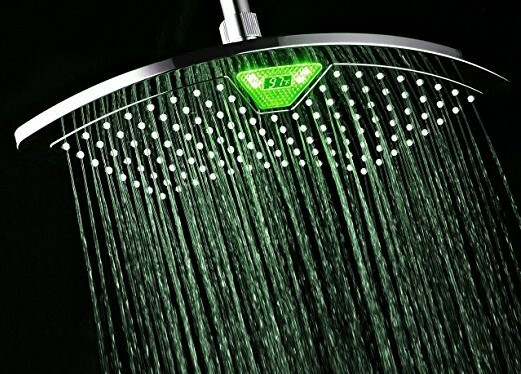 I agree with them, but the only thing I did not like about this shower head is that there are no adjustments other than the swivel, but as I mentioned above, this is a simple shower head, which doesn’t have the fancy LED lights or the speakers in it, but it is very high quality and will last you for years. It won’t get rusty and the hose won’t wear out in 2 weeks like on most of them. Most people chose this shower head because it’s extremely easy to install, and I would suggest this shower head to you if you are looking for a simple one too. This shower head overall looks good, and it comes in 4 colors: Brushed Chrome, Oil-Rubbed Bronze, Polished Chrome(See Picture) and Vibrant French Gold. 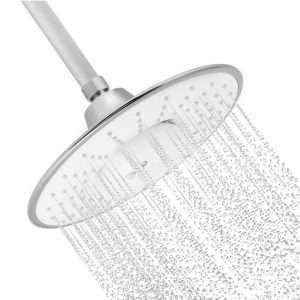 There is not much more to say about this shower head, and I included this on the list because some people just want a basic shower head that is cheap and gets the job done. You need a shower head to finish up your luxurious bathroom? Don’t look any further. The YAWALL Rainfall is exactly what you need. This is an amazing shower head that has the rain style spraying which looks and feels amazing in my opinion. It’s made of stainless steel, which is very durable and reflects most colors and fits almost every bathroom. Most of the companies advertise their shower heads as ‘strong steel’, but once you receive them they feel like cheap plastic and low quality, but YALLWALL definitely did a great job on the quality of the material. The size of it might be a bit big, but unless you have an extremely small bathroom it won’t be a problem. If you still insist that it’s too big, I have good news for you. It comes in 4 different sizes, which are: 10-inch square, 12-inch square, 16-inch square & the round 6-inch square. It’s big so it can cover every part of your body with water. Taking a shower under it will give you almost the same feel of rain, and you can only compare it to the showers in the $500-$600 range, which in my opinion are very expensive. With the YALLWALL you can get the exact same quality at a much cheaper price. It comes with a plumbers tape, which will make the installation of this shower head very fast and easy, so if you have no experience in installing them, this could be a great option for you. This is another great product for people that love to listen to music while taking a shower. The quality of the sound on this is better than we expected. To be completely honest, this is more of a radio than a shower head. Obviously, it’s a good shower head but the music player is better than it. On the music player, you can change songs, change the volume and of course, you can answer phone calls and talk on the phone while taking a shower. The microphone has good noise-cancellation, which means you don’t have to turn the water off to be able to talk. The water also feels good, it’s not too strong or too soft. It basically is how it should be, and it will allow you to have a great shower. The looks of it are very basic and similar to most other shower heads, but the functionality in this one is much bigger. It’s also very durable and if you decide to purchase this, you will have it for a long time. The installation is extremely easy and can be done by everyone without the need of any other equipment. So before we finish this review, I would also like to mention that their support is one of the best on the market and they will help you with anything you might need. Customers have even said that they replaced their products on some occasions. At number 1 of our best shower head, we have the ShowerMaxx shower head, which is a very good basic product which I would personally rate 8/10. 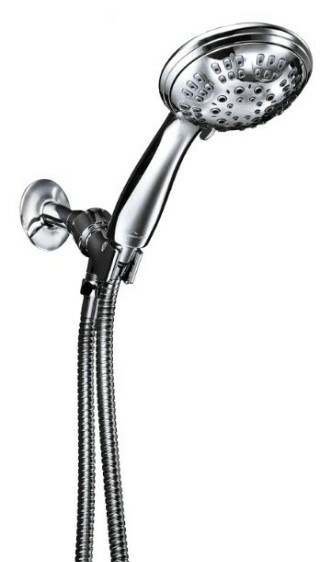 The only thing I don’t like about this shower head is that its handheld. That’s not a huge problem though because it comes with a holder. It comes in 4 colors: Chrome, Brass, Bronze & Nickel. The Nickel color looks great and I think that it can fit most bathroom designs. This product has 6 shower modes which is why I put this shower head on this list. You can choose a spray setting based on how you feel. It’s very advanced and it can do all of them without a problem. The settings it has are Rainfall, Circular Massage, Power Massage and Water Saver Trickle. The best thing about that is that you can combine them together, for example, Rainfall + Circular Massage. Not many shower heads offer that kind of settings so it deserves a big-up. The quality of the materials used also can be felt when touching them. As soon as you take it out of the box you will see that it is very high quality with a great finish. And I would say that this can be a long-term investment because it will last you for a long time. It’s a perfect choice if you have any kids or pets because this will make washing them a very easy process. Some kids or animals can’t handle high water pressure, so ShowerMaxx found a solution to that by making it possible for you to chose the pressure settings as you wish. If you are stuck and don’t know what type to purchase or what type you need, you do not need to worry, because I am going to talk in detail about each of them to help you purchase the correct one and the best shower head. These are the most common type. They are designed to make you feel like you are standing in the rain, which means that most of them are low pressure. Rain Shower Heads usually cover you with water on a shoulder-to-shoulder width and are very relaxing to take a shower in. They usually have a big plate from which the water comes out, and the water just falls out of it, it doesn’t spray like the other heads do it. Rain type shower heads are mostly installed on the wall, but if you wish you can get an extension arm and attach the plate to it. You can find extension arms online for very cheap. The title says it. This type of shower heads are mounted to the wall directly and they usually don’t require much space, since most of them are very small. This type of shower heads is very common and can be found in most homes. They get the job done perfectly. 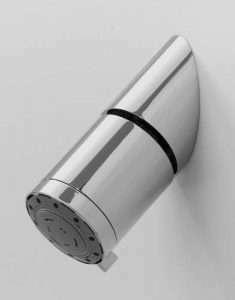 Since they do not require extension arms or hoses to be able to function properly, they usually come at a very cheap price which can be afforded by almost everyone, so if you are looking for a cheap one you should take a look at the wall mounted shower heads. Handheld ones usually have a lot of problems, like the shower hose wearing out, no one wants that to happen to them while taking a shower, right? They are also very uncomfortable because if you plan to use a handheld one, you will only be able to wash yourself with one hand, of course, if you don’t buy a holder for it. This is a very new technology which came out recently. If you are like 80% of the earth’s population, then you probably love to sing in the shower. These type of shower heads are created for people exactly like you. When they first came out, people thought that they are going to be very low quality, since you can’t hear the music from running water. They were proven wrong because most of them came out to be very high quality with clear and loud sound. Most of them also have the option where you can use the phone while taking a shower. Using the Bluetooth technology, now you can answer calls while taking a shower and it’s going to sound amazing because 70% of them have very good noise cancellation. one LED shower head, because they really give a taste to your bathroom, and will definitely make your bathroom look much better while taking a shower. 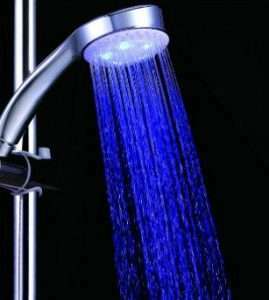 This type of shower heads usually have LED lights installed on them that can change colors automatically based on the waters temperature or you can set your preferred color and enjoy your shower! I wouldn’t call these a ‘type’, I would call these an option. 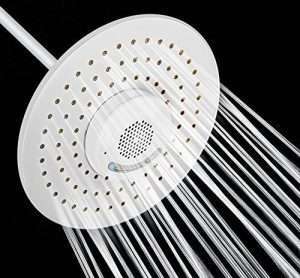 Depending on what type of shower you like, you can choose high-pressure or low-pressure shower heads. Low Pressure is the head that has the ‘water dropping’ feeling, which means they are not powerful and they do not spray. A perfect example would be the rain head shower. High Pressure shower heads have the strong water spraying feeling, and they can be found on most of the shower heads available, since most of the modern ones have settings where you can choose if you want the water to be high or low pressure. 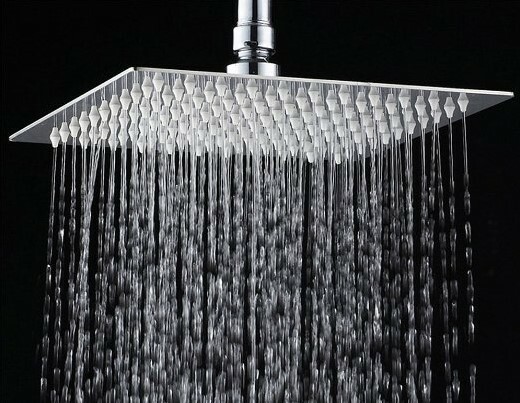 Waterfall Shower Heads are usually high pressure. When you first think of it, it sounds like a very hard task to do, but it’s the complete opposite because the new types of shower heads are very easy to install, and you can do it yourself easily, and the tools needed to do it usually are found in your house. If you already have one installed and want to replace it, first you have to take the old one off. You can do that by twisting it with your hand until it comes off. If that doesn’t work, then you will need a wrench to do it. When you successfully take it off, clean the tube and the left-over tape that is found on the tube’s head. You can do that by using a sponge or something similar. Be careful when doing that because you don’t want to scratch the tube for no reason. Now take the Teflon tape, and wrap it around the tubes head 2-3 times. After you’ve done that, take the new shower head and attach it to the tube and rotate it in the clockwise direction until it’s tightened. After you successfully did everything, turn on the water slowly to check if there are any leaks or any other problem. If there are leaks, check if you tightened it enough, and also check if you put enough Teflon tape on it. Every shower head comes with a instructions manual, so remember to check it before attempting to do it yourself, because every shower head is different. What Else Do I Need To Complete My Bathroom? You might have followed our guide and got yourself the best shower head , but that’s not enough to turn your bathroom into a luxurious place. If you are planning to fully equip your bathroom with other things also, please keep reading and follow our guides on other best products. If your shower cabin does not have a sliding door, you probably need a shower curtain. I personally prefer the shower curtains over the sliding doors, because the sliding doors tend to break very often, and they usually are very ugly. 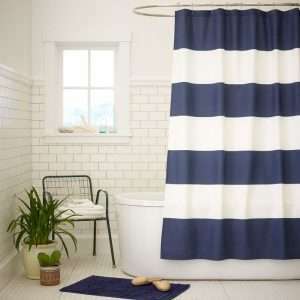 On the other hand, there are a ton of shower curtains available in many different colors, and you can make them match your bathroom design for very cheap. Another thing you definitely need for your bathroom is a good shower mirror. There are a lot of shower mirror types, some are made for inside the shower cabin and some are outside, also known as the bathroom mirrors. If your current mirror is old, then you probably don’t know about the new types of mirrors with beautiful lights and other things, so make sure to check them out too! Imagine it’s a freezing winter day and you get up in the morning, take a shower and when you are done, you have a cold towel which you are too scared to put on. 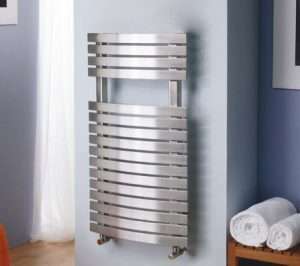 Why not buy a towel warmer and enjoy your shower even more? Wrapping a warm towel around your body after you get out of a shower is one of the best feelings in the world. It would be nice to also have a shower panel in your cabin because you need a place to store the shampoo, the brush and other things that are required when you are taking a shower. I would definitely recommend you to buy one if you want to keep your bathroom organized. If your bathroom has small windows and can’t get any air in it, then you definitely need a bathroom fan too. Bathroom fans are a must if you want your bathroom walls and other things to stay new. Actually, not only in the bathroom, but you need a fan everywhere that has humidity. So if you got your best shower head, then it’s time to get the bathroom fan too! Shower Filters are extremely important if you live somewhere that has dirty or chlorinated water. Chlorinated water can damage your skin and hair, making showers a bad experience for you. Unfiltered water also brings a lot of harmful unwanted substances which can damage your overall health, so getting a shower filter can help a lot!